One reason Richard J. Wershe, Jr., better known publicly as White Boy Rick, remains in prison doing a life term for drugs, seems to be a belief among some in Detroit’s criminal justice system that Wershe was the FBI’s only source of information in the highly controversial killing of a young boy by a Detroit drug gang with political connections. It’s not true. Johnny Curry, the gang leader, was himself a source of information for the FBI about the murder of Damion Lucas, both at the time of the murder through things he said on a tapped telephone after the killing, and later in prison when he was interviewed by agents. Another source was Kevin Colbert, a member of the Curry drug gang. Readers of this blog know it has been slogging through the details of the rise and fall of Richard Wershe, Jr.—AKA—White Boy Rick, mostly in chronological order. Recent posts have focused on the 1985 murder of 13-year old Damion Lucas, an accidental drug-gang killing that plays a critical role in the shameful insistence of some on keeping Wershe in prison when others who did far worse have been paroled. 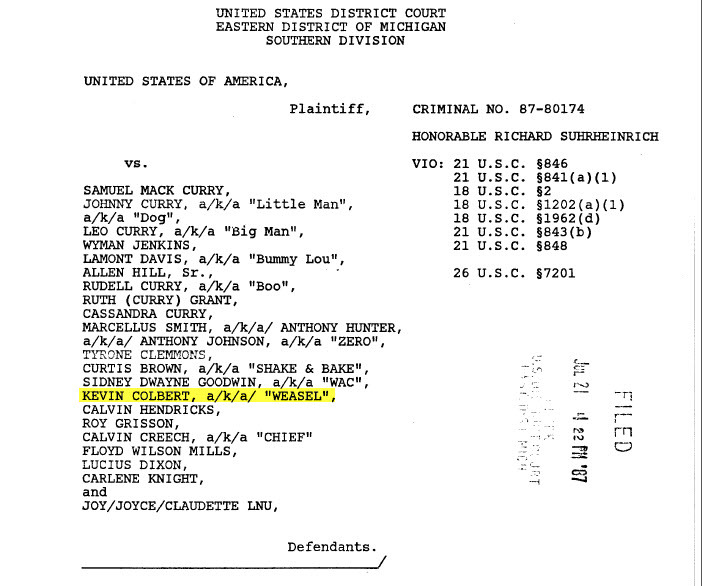 This post continues the focus on the Damion Lucas killing but jumps forward in time a bit to explore what a member of the Johnny Curry drug gang told the FBI about the death of the young boy. Kevin Colbert—known on the street as “Weasel”—was among those indicted by a federal grand jury for his role in the Curry Brothers drug organization on Detroit’s east side. Johnny Curry and two of his brothers ran a dope dealing operation that had political connections. Curry was engaged to and then married Cathy Volsan, the attractive niece of the late Coleman Young, Detroit’s powerful mayor in that era. Kevin Colbert was among those indicted in the federal case against the Curry drug gang. The case never went to trial. Johnny Curry and his gang pleaded guilty in exchange for shorter prison sentences. Such deals are known in federal courts as a “Rule 11.” As part of the plea deal, the defendants admit their guilt and submit to a debriefing by the FBI in which they detailed their knowledge of various elements of the criminal enterprise. These debriefings often lead to new investigations. FBI agent Gregg Schwarz, now retired, debriefed Kevin Colbert. FBI investigative reports are known by their bureaucratic form number—302. The 302 detailing Kevin Colbert’s debriefing includes his version of the Damion Lucas murder. This blog quotes extensively from FBI 302s and other historic investigative file reports. One reason for that is much of the Rick Wershe story is old history and memories fade. The reports in the files were written at the time the events happened. Schwarz, who believes Rick Wershe should have been paroled long ago, thinks the Kevin Colbert Rule 11 debriefing is significant because it shows White Boy Rick wasn’t the only one who gave information to the FBI about the Damion Lucas murder. The Damion Lucas case has never been solved. FBI agents believe the investigation was deliberately thwarted to protect Johnny Curry, and by extension, Cathy Volsan, the mayor’s niece. That is called obstruction of justice and it is a felony. The focus from the beginning has been on then-Inspector Gil Hill, the head of the Detroit Homicide section at the time. Hill was politically powerful, with connections far beyond his rank. For one thing, he was a local celebrity thanks to his role as Eddie Murphy’s tough-talking cop boss in the hit movie Beverly Hills Cop. Detroit is a town starved for celebrities, so when it gets one, the people cling to the star in their midst tenaciously and go to great lengths to defend him or her. If someone criticizes their local hero, many people take it personally. That translates in to political power. When the Damion Lucas murder happened, Gil Hill was a Detroit celebrity with political ambition. He retired from police work and ran for the Detroit City Council. He won. Eventually he became council president. He made an unsuccessful bid for mayor, too. Through it all, the FBI investigation of his possible obstruction of justice in the Damion case dogged Hill like a shadow, even after the statute of limitations for prosecuting him passed. Hill is retired now and reportedly in declining health. Some say he partly blames Rick Wershe for losing the mayoral election due to Wershe’s role in informing the FBI about the Curry gang involvement in the Damion Lucas murder. Still others speculate and theorize—and it’s important to use those terms—that law enforcement/prosecution friends of Hill have a to-this-day vendetta against Richard Wershe Jr. as a result of the FBI obstruction of justice investigation, which never resulted in an indictment or charges. Hill is a black Detroit celebrity and some believe the mostly-white FBI was just trying to discredit another black hero. Colbert admits he was the driver of the car that took the shooters to their destinations. On the night of April 29, 1985, a car in the driveway of Robert Walton and the front of the home owned by Leon Lucas were riddled with bullets from automatic weapons. One of the bullets fired in to the Lucas house killed Damion Lucas, who was watching TV with his younger brother. Interestingly, Colbert attributes the shooting of the Lucas home to Sidney Goodwin and Walter Owens. The FBI investigation focused on Wyman Jenkins as one of the prime shooters and an FBI wiretap of a Johnny Curry telephone call captured Curry talking about Jenkins as a prime suspect. Retired agent Schwarz says in criminal investigations it’s common for different sources to say different things. “They tell you what they think you want to hear,” is the way Schwarz puts it. To look at it another way, a criminal spilling his guts to fulfill a federal Rule 11 plea agreement may tell you the truth, but it may not be all of the truth. It may be slanted truth with emphasis here and de-emphasis there or an omission entirely. It never came to that. FBI telephone pen registers, which preceded actual court-authorized listening via wiretap, showed a call the morning after the Damion Lucas killing from Johnny Curry’s house to the unlisted home phone of Detroit Police Sgt. James Harris, a member of the mayor’s security detail who had responsibility for looking after the mayor’s family, including Cathy Volsan. The call from Curry’s house to Harris’ house was immediately followed by a much longer call from the Curry phone to an unlisted private phone at Detroit Police Headquarters which was in the office of Homicide Inspector Gil Hill. Leon Lucas and Robert Walton both told homicide investigators they believed the Curry drug gang was responsible for the fatal drive-by shooting. After the call from Curry’s house to Hill’s office, no one in the Curry organization was ever questioned by the Detroit Police regarding the Damion Lucas murder. The investigation focused, instead, on an innocent man who was charged with the Damion Lucas murder. Charges against that man, LeKeas Davis, were eventually dropped after a dramatic intervention by the FBI. Herman Groman, an FBI agent on the Curry case, told Davis’ defense attorney that the Bureau had informant information that it was the Curry gang, not LaKeas Davis, who killed Damion Lucas. But Groman was determined not to reveal his source. He almost went to jail as a result of protecting the informant’s identity. The informant was Richard Wershe, Jr., White Boy Rick.